What if our website could connect people in need with resources to help them, describe our programs and services, and pair volunteers and donors with opportunities? 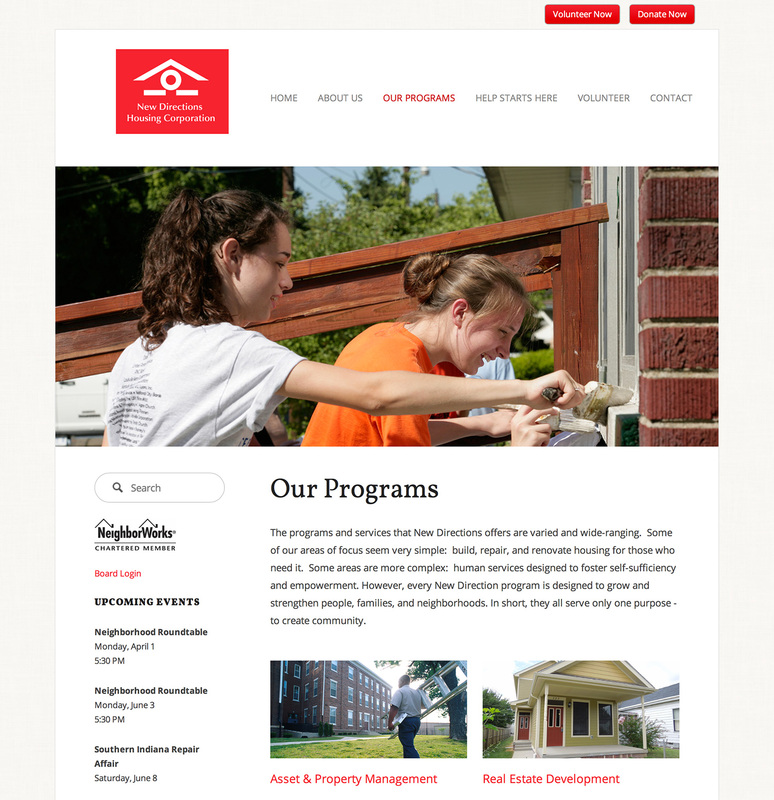 New Directions Housing Corporation is an extraordinary non-profit with a singular goal of community development and vitality, but with an extensive array of services and programs to support this goal. They needed a website that could serve as the hub of all corporate information and activity, and which they could keep updated by themselves. Summa Creative was asked to design a website that was robust enough to handle the many needs of NDHC, and also be easily maintained and navigated. 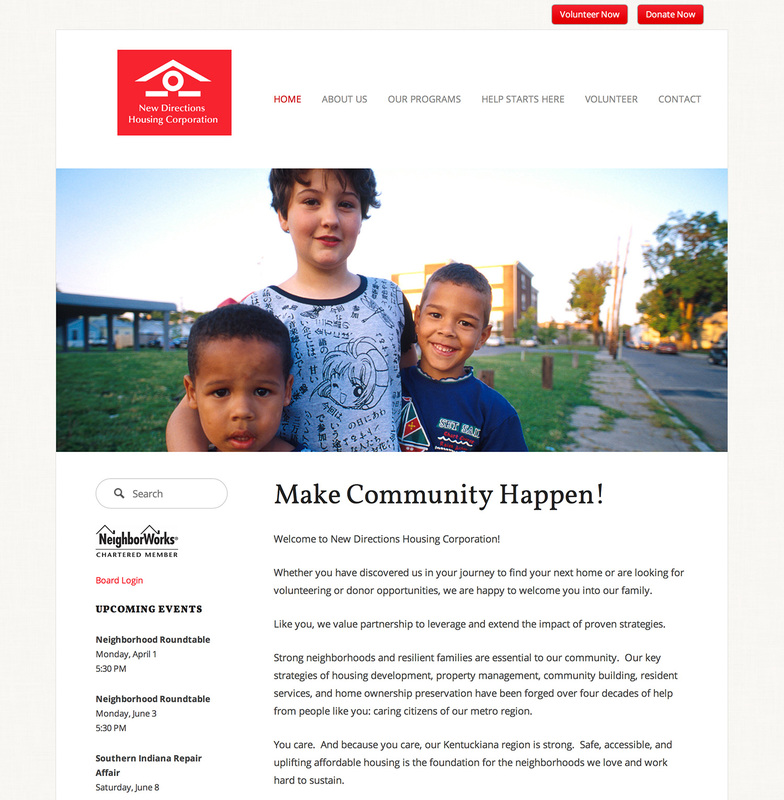 The site would have to provide a means to schedule neighborhood programs and initiatives, accept donations, connect people with resources, describe and schedule volunteer opportunities and coordinate volunteer groups, list upcoming events, and present their many housing developments, along with resident requirements. The lion’s share of work on this website was uncovering and learning all of the facets of this layered organization and defining the site goal and audience. We led months of discussions with executive and senior staff to arrive at the architecture of the site, balancing users’ needs with the communications that NDHC needs to convey. The build of the site as a content management system was determined early on. The site would need constant updating and attention - adding and removing real estate entries, updating schedules and event dates that affect thousands of volunteers, etc. Being a non-profit, the budget was not available to hire someone specifically for website maintenance. Staff from every department would be tasked with web support. Use of the previous website was also found to be overwhelmingly mobile. Be it from staff in the field, or from people whose only access to the internet was their phone, the site needed to be accessible and easy to navigate. For an organization that is sustained by people who want to give of themselves to make a difference in the community, clear links to ‘volunteer’ and ‘donate’ are present on every page. All of the site imagery is photography of those involved - volunteers at work, individuals who have benefited from one of the programs, or images of the growing communities, creating an immediate connection with the help and benefits provided. 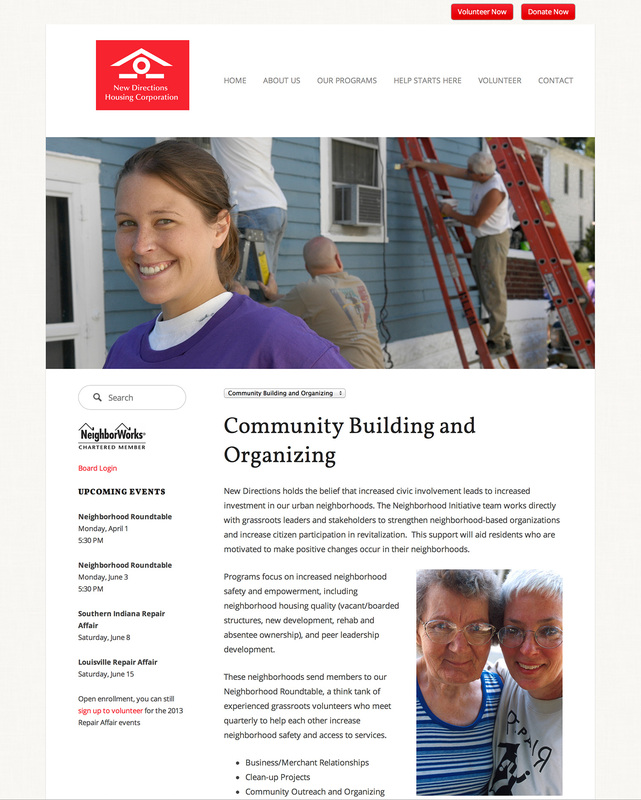 The website is truly the single point of information for this multi-faceted organization, helping neighbors grow vital communities.